Do you have ancestry in medicine? 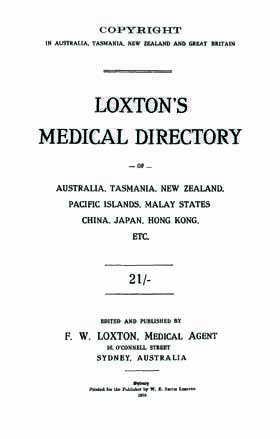 The Loxton's Medical Directory is similar to Bruck's, but is a lot more comprehensive in many areas, as well as including many extra features unique to this publication. Primarily covering all Australian States, New Zealand and the Pacific Islands, you will not only find a listing of all registered doctors, together with their current placement, but also statistics of operations at all major hospitals. The gazetteer in this directory is very extensive, and would enable a doctor to gain a clear picture of what his town of destination would be like, as the major facilities are listed together with the town's population and the climate for various times of the year. This is a wonderful genealogy tool for anyone with ancestry in the medical profession - valuable to both historians and those looking to build their family tree.